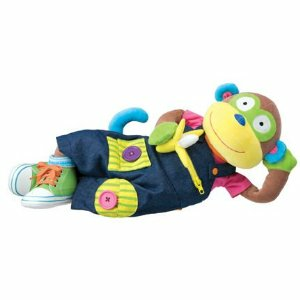 Alex Learn to Dress Monkey is a 22" long plush doll has 11 dressing activities that helps develop fine motor skills. Learn to snap on straps, button, hook and loop, zipper and more. It comes with real socks and lace up sneakers. Shirt and overalls are removable, too.